Tonbridge is a market town located in Kent. It boasts a £4 million landmark building in the form of The River Centre which is used as a community centre and an conference centre. 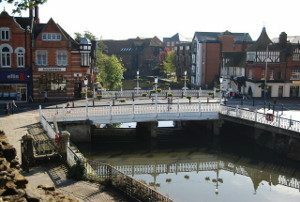 Tonbridge can be reached by car via the A21 and A26. Tonbridge is well served by public transport including Tonbridge railway station, one of the busiest in Kent. Lanes School of Driving was established way back in 1914. Since then, Lanes has been teaching generations of locals how to drive. From its humble beginnings, Lanes has gradually grown to become one of the largest driving schools in the UK. Lanes is synonymous with the highest standards of excellence in driving instruction, backed by years of experience. Lanes takes care to cater to each student’s needs and lessons are carefully tailored to suit. Lanes understands that students are busy and that lessons can be booked around existing commitments. Lanes believes in allowing students to learn at their own pace. Lanes is distinguished amongst driving schools in offering one-to-one tuition so that students can learn without undue distractions from other students. Lanes has a selection of modern and up to date cars brimming with with the latest technology, ensuring that students have the best possible learning experience. For the convenience of our students, Lanes will pick them up from their homes prior to each lesson. Lanes have been providing driving lessons in Tonbridge for many years. Please call us today on 020 8166 5678 or click here to send us an email via the contact page. Lanes has available a team of instructors who have decades of experience between them. Each instructor is qualified to the highest standards as a DSA Approved Driving instructor. The overwhelming number of our instructors began their initial training with us. We aim to provide the best instructor-student relationship and we make sure that each student keeps the same instructor for all their lessons. We do this so that each instructor is well aware of their student’s needs and is able to provide an individual approach. Lanes have a team of driving instructors in Tonbridge, Kent. Please call us today on 020 8166 5678 or click here to send us an email via the contact page. Learning to drive can be very daunting, especially in the presence of a stranger. It is not uncommon for female students to be nervous about having a male instructors. We are more than happy to allow our female students to choose one of our many female driving instructors. Our female driving instructors are uniformly considerate and understanding. They will not pressure their students. Our female students are always very happy with our female instructors and report that they feel less pressured. Lanes have a selection of female driving instructors in Tonbridge, Kent. Please call us today on 020 8166 5678 or click hereto send us an email via the contact page. Quite a number of Lanes’ students decide they would rather learn in an automatic car as opposed to a manual car. Advocates of manual cars say that they allow greater control. While this may be true, automatic cars are certainly less daunting for the beginner. Beginners always have a problem with inadvertently stalling their cars. They will be relieved to hear that automatic cars are impossible to stall. Automatic cars provide an easier experience for the beginner and progress will often be easier. Lanes have a selection of automatic driving instructors in Tonbridge, Kent. Please call us today on 020 8166 5678 or click here to send us an email via the contact page.